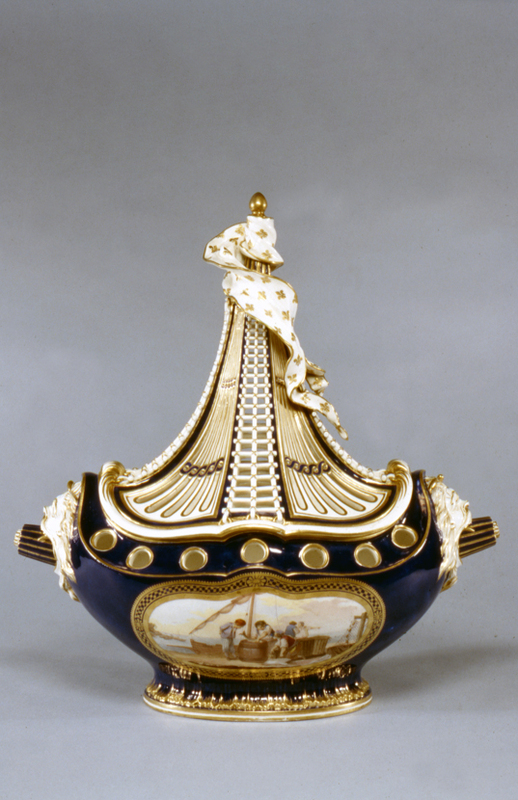 Sevres porcelain was originally called Vincennes porcelain (in Vincennes) which was founded in 1738. It found patronage by Louis XV and Madame de Pompadour in 1740 and moved to Sevres in 1756 and changed its name to Sevres. In 1759, Louis XV bought the enterprise outright. To some people, these pot-pourri vases may seem like a fussy relic of the past. But if one know how difficult and time consuming it was to make these pot-pourri vases, one probably would not incline to dismiss them so quickly. 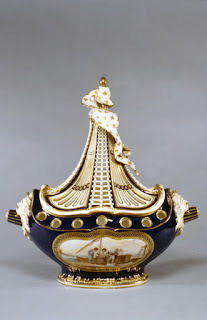 A typical 18th century soft paste porcelain of this caliber is very difficult to make because electric kilns were not available. To judge the temperature inside of a kiln, a kiln master needed to eye ball color of the fire and to decide when to put in pots and when to take them out. And of course mother nature was not predictable then(and still isn't now). So when it rained, they needed to add more firewood into the kiln to make the kiln hotter. Or when weather was hot, maybe not burned so much wood. In addition to that humidity and wind also effected temperature inside of a kiln. So for a piece of porcelain to go in and out of a kiln in 18th century and be able to come out whole (not wilted, exploded, or sagged) was often counted as a miracle. And if you wanted to add color, that added more risk. If any of you have painted a pottery at your local art shop, you know if you paint a certain red the shade of red will be different from the one you painted after firing. Well, it was like that in 18th century too. In addition, each color fired at different temperature. So anytime you see a piece of 18th century porcelain with various colors on it, that meant it had gone in and out of a kiln multiple times. And like I said before each time a piece went into a kiln, there was a possibility of breakage due to unpredictability of weather; hence each piece of polychrome porcelain came out of a kiln in 18th century was almost a little small miracle. This particular model is the rarest of all Sevres models because the multiple piercings in the body weakened the overall structure. This means not only they have to take into consideration of weather, but they also tend to collapse in the kiln due to weight. There were only 12 made out "alive" from the kiln in 18th century and only 10 are known today. Queen of England has one. Waddesdon Manor (of Rothchild) has three! Wallace collection in London has one. Louvre has one. And rest of the four are in US collections: the Met, the Frick, the Getty, and the Walters Museum.